Yesterday, Saturday, snow fell all day. There must be six inches even in the middle of Koriyama. Didn't take the car out. Walking treacherous; the pavements solid ice. But, hell, there must be some compensations and one of them is being near the ski slopes. When I grew up in Yorkshire, skiing was only for the rich and famous. 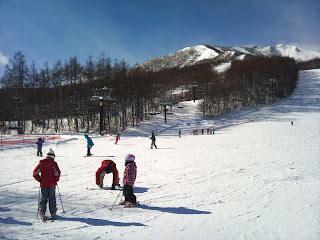 Not the case now of course but when I first came to Japan I jumped at the chance to learn to ski and I still get a kick out of going skiing just for the day. Trains and buses to Aizu were cancelled because of the heavy snowfall or 'big snow' as they say in Japanese ( 大雪 ooyuki) so I got a bus to Adatara. It's the mountain directly north of Koriyama, the one we see all the time, 1,700 m. high. And the place was full of happy people of all ages. I met several people from Tokyo. 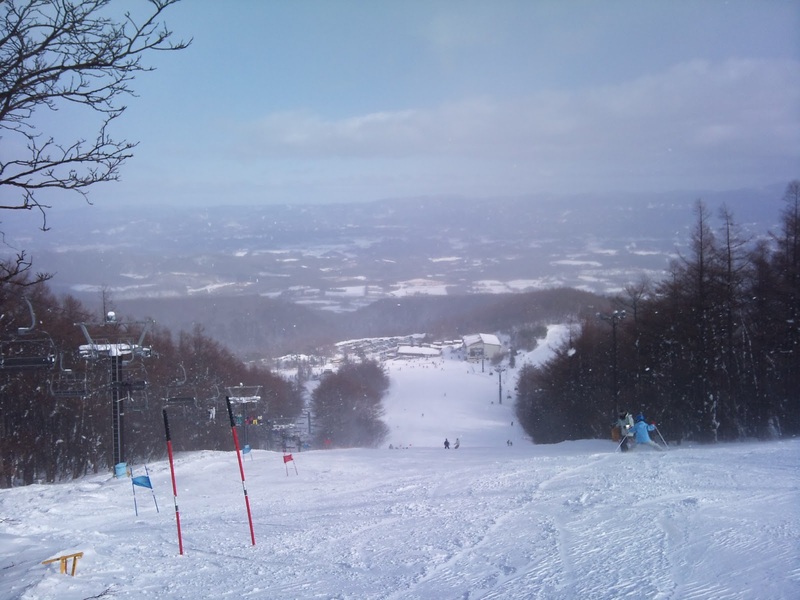 One of them said he has a friend who comes from Fukushima who'd told him to do all his skiing in Fukushima this year. Some people on a bus tour from Ibaragi (95 miles away) were taking advantage of the same package I was: bus, lift pass and ski hire all in for 7,000 yen (mine from Koriyama station was 6,000 yen). 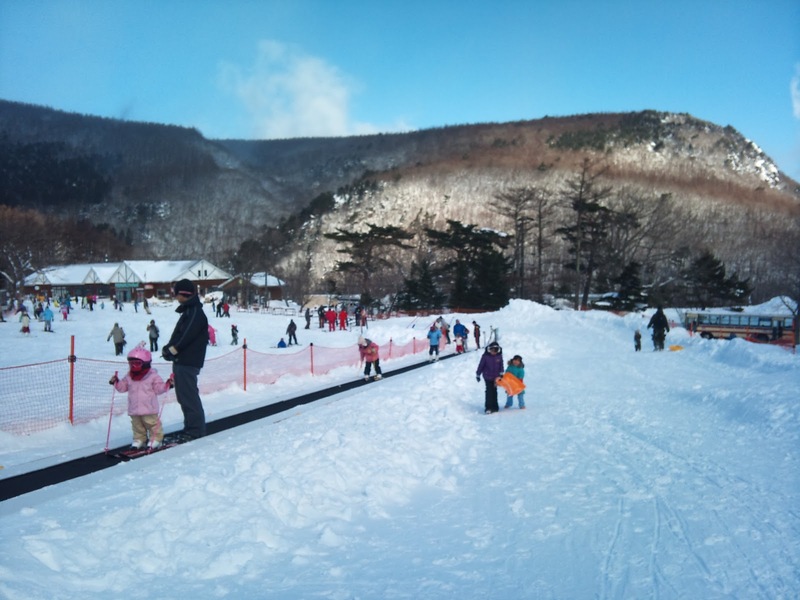 The papers were saying that the number of skiers at the new year was back up to 90% of pre-disaster levels. My straw poll today would suggest that thanks to promotions by the resorts and support from lots of people, things are pretty much back to normal. 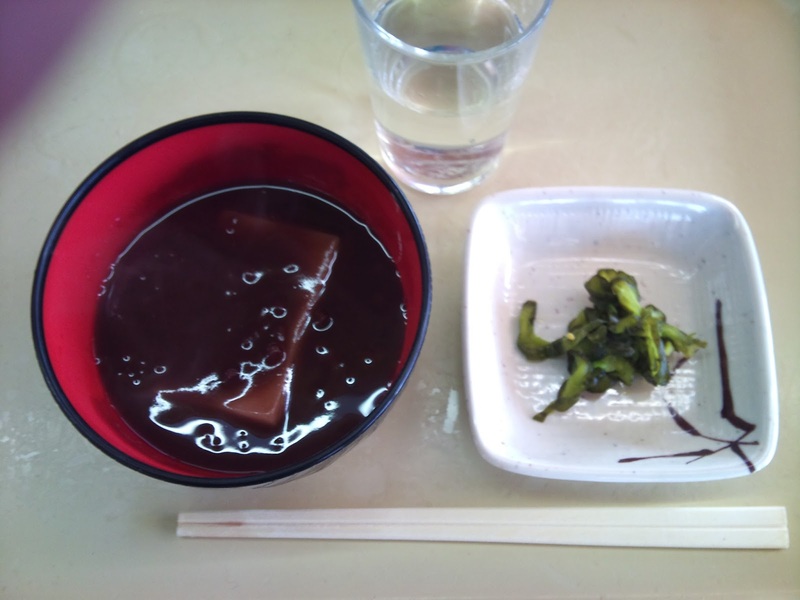 And to top it all, I found that the oldest of the eateries was serving my favourite ski food, o-shiruko, aduki beans cooked with sugar and topped with a rice cake. This traditional dish doesn't seem to feature on menus in the more upmarket resorts but to me it's the Japanese equivalent of an apres-ski hot chocolate. Tomorrow morning I have to do the morning pep talk at the factory offices. I plan to leave a full hour earlier than usual as in these road conditions there are bound to be long jams on the main roads. But today at least I had a good time in the snow. Kiddies' toboggan run complete with escalator for the upward haul!